Do you ever find yourself confused about the war and violence that pervade our post-9/11 world? On the one hand, the Bible and Christ speak of loving enemies and self-sacrifice. On the other hand, the world around us teaches, and most Christians seem to simply accept, that violence is necessary in a world wrecked with sin. Are Christians a people of peace? Does that peace have to be won through war? Should we fight for our convictions? Or die for them? Jonathan and Derek invite you to come along with them as they explore the biblical teachings on war and violence and attempt to construct a solidly biblical and uniquely Christian view of war and violence. Derek Kubilus is currently a candidate for ordained ministry in the United Methodist Church. He is looking forward to a career in writing and ordained ministry. Jonathan Priebe is a candidate for Deacon in the United Methodist Church. He and his wife, Kattie, have led several short-term mission trips and await God's leading for a place of long-term service. 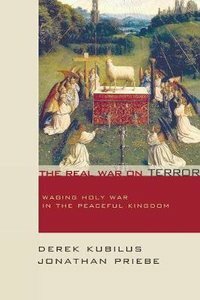 About "The Real War on Terror: Waging Holy War in the Peaceful Kingdom"